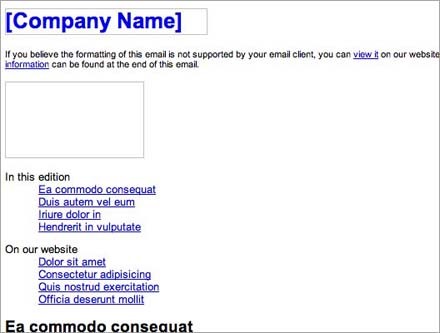 How do alt attributes appear in email? We’ve tested to see how alt attributes are displayed (or not displayed!) in popular email clients. But before we look at the “how,” let’s look at the “why” in ALT text. Webpage: Mark Wyner Design, Web Design Studio—Portland, Oregon. Link 1: Navigate directly to content. Page headline, link 2: Mark Wyner Design. Sensible design. Accessible content. Usable interface. A secondary purpose, however, is to describe an image to someone who can not or chooses not to view images in their browsing device or email client. Sadly, the latter doesn’t always work out because many browsers/clients either do not render ALT attributes when images are disabled or render their own variations thereof. 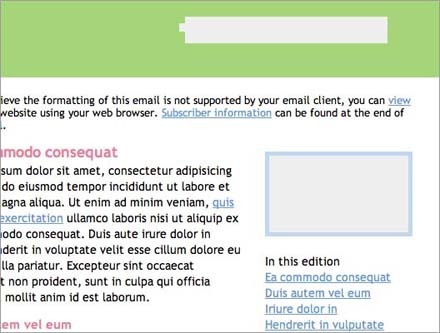 In this article I’ll outline how common email clients display (or don’t display) ALT attributes. 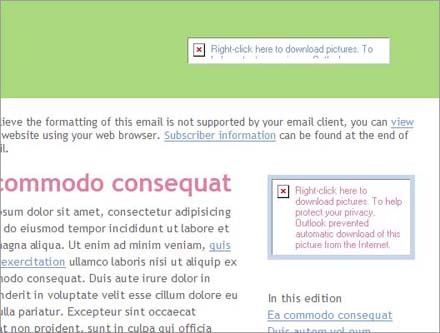 A trait shared among all email clients—webmail and desktop—is the ability to disable or enable images by default. And nearly every client in my test suite enabled me to load images directly from the message if they were disabled by default. 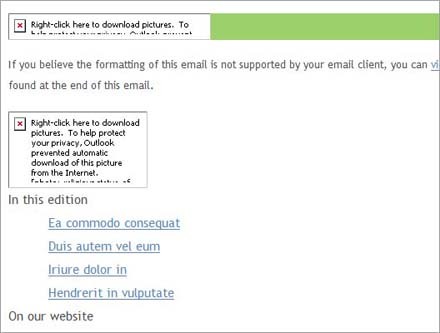 The exception is Windows Live Mail in which images are loaded for known senders and disabled for unknown senders, the latter scenario exhibiting a link to enable them on the fly. 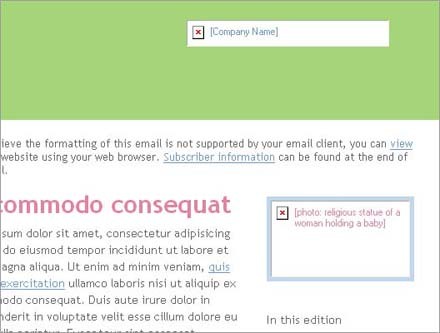 The interesting thing about Yahoo Mail Beta is that applies contextually relevant CSS to the ALT text itself. So although it displays ALT text, the potential problem is that large font sizes can push the information beyond the visible border of the image box, rendering it unreadable. But this is, of course, a naturally occurring problem across the board, especially with smaller images and larger descriptions. Initially, Gmail only displayed some of my ALT text. Further testing yielded the conclusion that text length was the deciding factor. 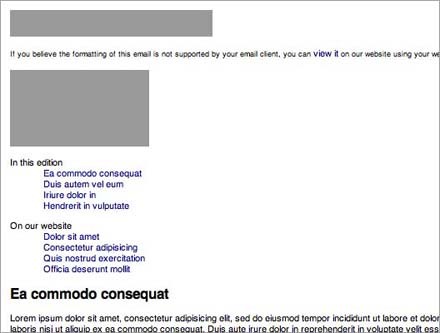 Whereas most clients display what text they can within the boundaries of a box, Gmail decides that if the text extends beyond the said border it will display nothing. Nice. 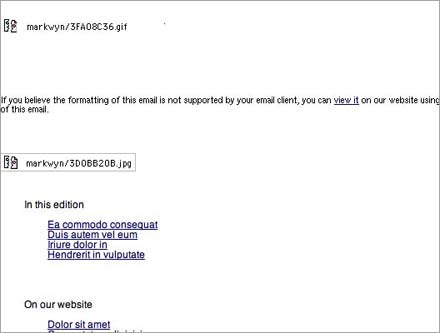 .Mac suffers parallel to Gmail when rendering ALT text, in that it reserves text-length contingencies. 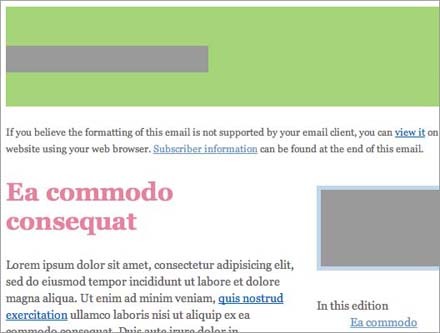 The clients which do not display ALT text typically display gray boxes in place of the images. Apple Mail, however, displays open space and adds a little question-mark icon. 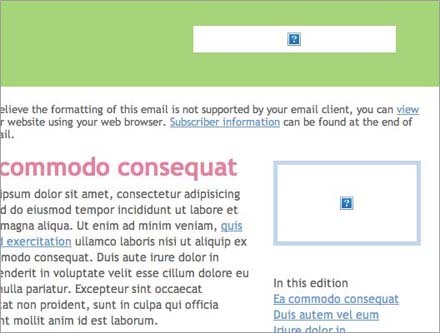 As with Yahoo Mail Beta, Thunderbird applies contextually relevant CSS to ALT text. Again, there are no paramount consequences of this result, but it’s noteworthy all the same. 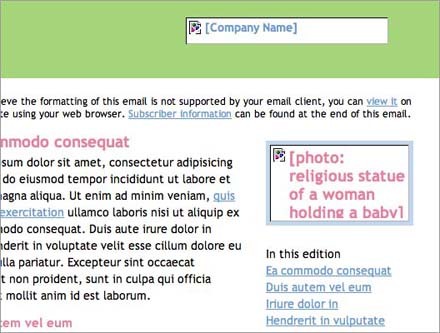 Outlook 2007 prefaces all ALT text with its long-winded explanation of why an image was omitted from a message: “Right-click here to download pictures. To help protect your privacy, Outlook prevented automatic download of this picture from the internet.” This falls down in two very specific ways. First, this is the kind of message which should merely introduce someone to a feature. To repeat it for every image in every email indefinitely is a plethora of information. Second, it pretty much wipes out any ALT text which follows it, given the length of the preface and the average image size in an email. 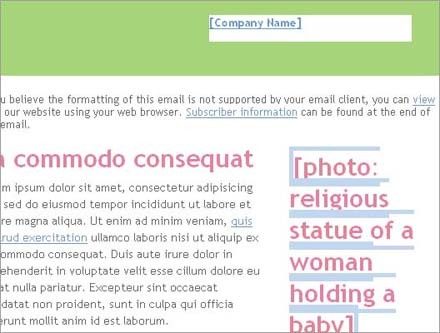 While Yahoo Mail Beta and Thunderbird apply CSS font-size and color properties to ALT text, Outlook 2003 only applies color. Outlook 2003 is also the origin of the security-message-replacement woes of Outlook 2007. 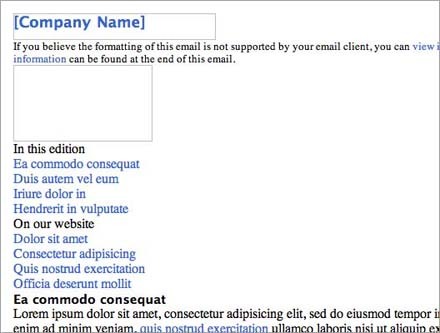 Outlook Express is parallel to Outlook 2003 regarding CSS font-properties. Eudora replaces ALT text with an absolute URL to the location of a respective image, but given that the path to the images is truncated, one ponders the value of this system. Head-scratchingly, the disable images setting yielded no changes in how images were displayed.